Mix the marinade ingredients in a small bowl and whisk until well blended. Place the split chicken halves in a resealable plastic bag and pour in the marinade. Seal the bag and marinate the chicken in the refrigerator for 8 to 12 hours. Build a charcoal fire for indirect cooking in an outdoor grill. 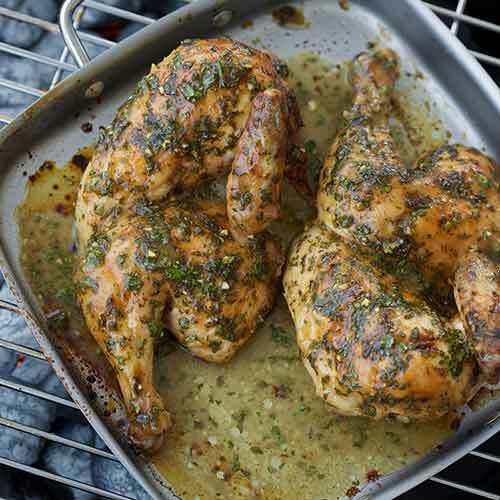 When the temperature is approximately 375˚F, remove the chicken from the marinade and place the chicken halves, skin-side-up, in a 9-inch baking pan. Pour the remaining marinade over the chicken. Place the pan over indirect heat, cover the grill, and cook for 2 hours or until the internal temperature of each thigh reaches 175˚F. Baste with pan drippings before serving.